Okay, last one for today. The images are pretty self-explanatory, but I’ll explain anyway. 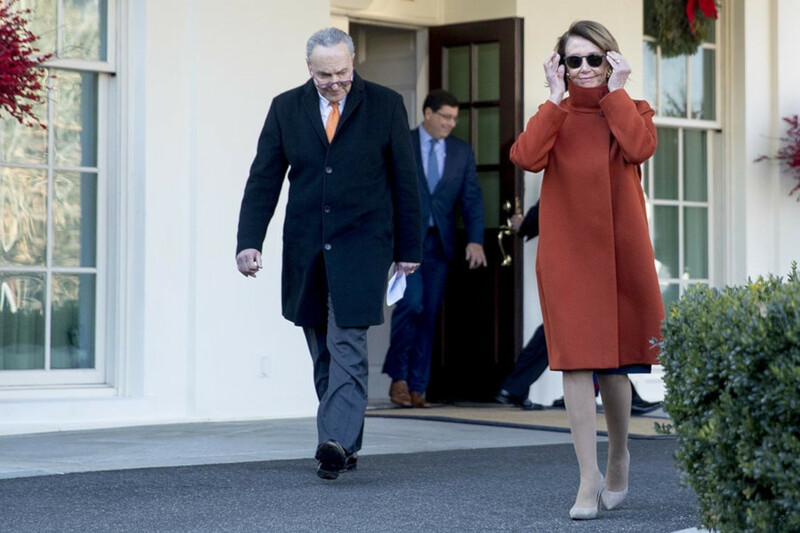 The one at the very top was taken of Nancy Pelosi and Chuck Schumer leaving the White House after a recent meeting with President Donald Trump. According to various sources including The New York Times, Pelosi pretty much “owned” Trump in that get together, and you can see in the photo above, she looks well pleased with herself. Sort of a cat vs. canary moment, and she gets to be the cat. 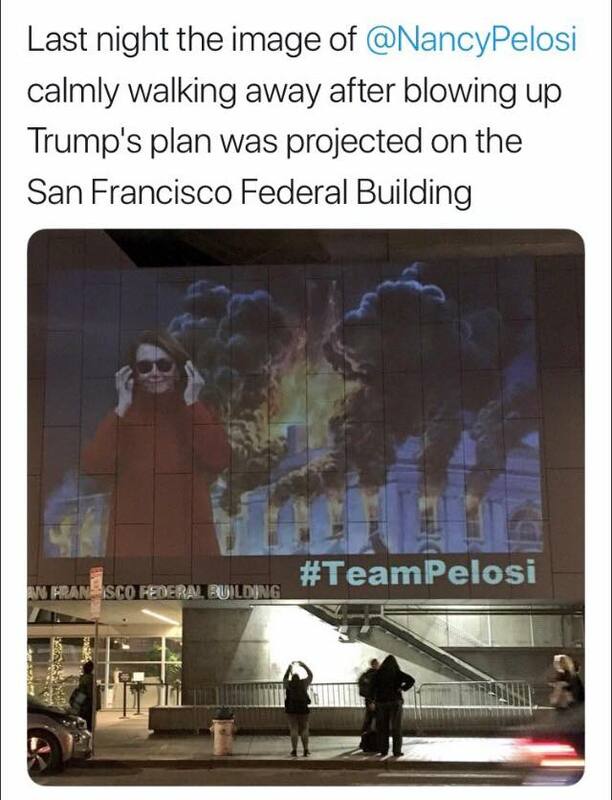 So someone used their vast Photoshop skills and created the following, which was supposedly projected on the side of the Federal Building in San Francisco. I’m sure a lot of people loved it. Image projected on the side of the Federal Building in San Francisco – Image attributed to @laureldavilacpa on twitter according to the Times article. However, I immediately thought of the “evil girl burning house” meme and decided to “marry” them. I think it turned out well for a “quickie” job, it’s really funny, and I’ve already shared it on Facebook and twitter. Of course a successful and/or capable woman is evil while a disgusting and had guy is a poor innocent (or thereabouts). Maybe this is another Storm Front thread. What I typed in was the word “bad” (not had)… bad guy. It was a joke. Someone made a meme of Pelosi walking away from a burning White House and the very first thing I thought of was the “evil girl burning house” meme, so I rolled with it. Besides, there’s so much “love” for her on social media because of her encounter with Trump, I decided to “humanize” her a bit. But there’s more. Just because she’s a woman and a liberal doesn’t make her perfect, and before you (or anyone) says, “She’s better than Trump,” I’m talking about looking at her objectively, not in relation to anyone. … you’ve nevertheless portrayed her as drastically worse. Humanizing, you say; what a farce. Pelosi has been a member of the House since 1987, so I suppose she’s amassed quite a bit of power by now. That said, there are a lot of young Senators up and coming who would love to knock her off her pedestal and take her place (and I mean young Democrats). As far as the meme goes, all politicians are fair game and I’m sure this isn’t the first time she’s been lampooned. Our sad joke of a president asks the others which one of what he’s signing is the one that matters. I do like the caption under the very first photo.